The high valley of the Engadin with its wonderfully varied network of trails – 580 kilometres (360 miles) in all – is heaven for hiking. The contrasts that characterise this region are bewitching: gently sloping hills draped with lush alpine meadows stand close by mighty glaciers, towering snow-capped peaks and sparkling lakes. The best way to explore this unspoilt landscape is on foot – whether hiking along one of the breathtaking panoramic trails or one of the fascinating theme trails, on a walk along the sparkling lakes, or on a multi-day trek. The comprehensive network of trails also includes pushchair-accessible paths that are particularly suitable for families. Those preferring a more ambitious mountain hike can make for one of the four areas served by the mountain railways and cableways: Corviglia/Piz Nair, Corvatsch/Furtschellas, Diavolezza and Muottas Muragl/Alp Languard. These all offer thrilling high-altitude trails with spectacular views. The trails are clearly signposted, and classified according to the guidelines of the BAW (the Graubünden footpaths organisation). 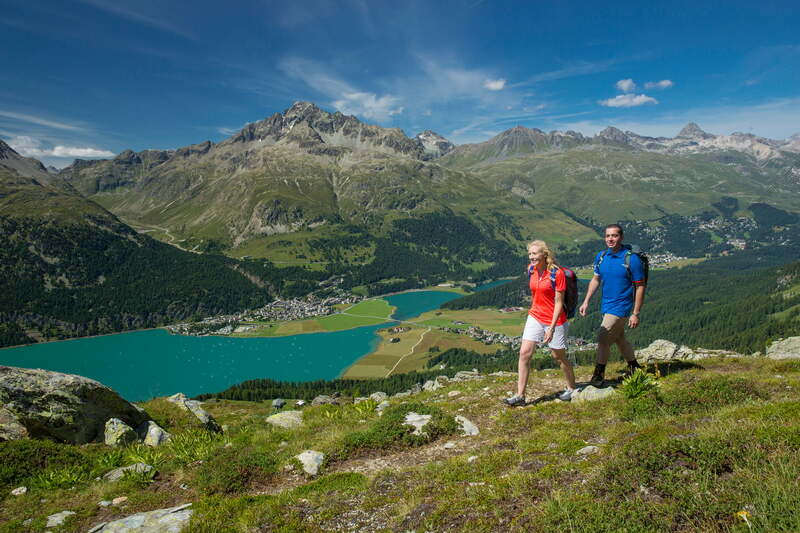 Enjoy the breathtaking vistas of the Engadin valley. Discover the charm of the Engadin’s magical waterside walks. The second stage of this dazzling hike starts at the restaurant Alpenrose between Sils Maria and Sils Baselgia. Enjoy the most inspiring high-lying valley in the Alps over various stages during several different tours. The Senda Segantini is a 4-day hiking route from Savognin to Samedan, It follows the footsteps of Italian painter Giovanni Segantini. The Via Engiadina follows a route not far above the floor of the Upper Engadin valley.